The Wiliwili Festival is back! Please join WDFI Saturday September 27th in celebrating our native dryland forest and the wiliwili flowering season. 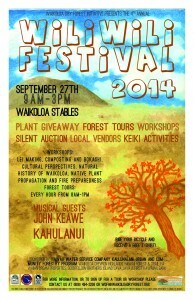 The festival is FREE from 9am-3pm at the Waikoloa Stables in Waikoloa Village. The festival will offer educational workshops, tours, vendors, native plant sales, prizes, keiki activities, silent auction, great music, food and much more! Come and learn how you can help us to Plant Trees in your community forest; arrive early and you could take home a free native plant! We are planning a zero-waste event and hope that you can do your part in keeping our festival footprint small, please carpool, and if you opt to ride your bicycle you will receive a free t-shirt. Forest Preserve tours will be offered every hour, on the hour, from 8am-1pm. Tours will begin at the stables and will be led by knowledgeable and enthusiastic guides and will showcase the flowering wiliwili trees, our restoration work and our nursery. Tours will last about one hour and participants are encouraged to wear good shoes and to bring a camera! Transportation will be provided by Hawai’i Forest & Trail and a $25 donation per group is encouraged. WDFI is a 501(c)(3) non-profit and all donations are tax-deductible.